Catch the wave of the re-imagined hit drama in its sizzling, landmark first season! Lieutenant Commander Steve McGarrett (Alex O'Loughlin) leads an elite crime-fighting force, cracking the island's toughest cases while also tracking down the elusive killers of his legendary father. Joining the intensely driven McGarrett are by-the-book Detective Danny "Danno" Williams (Scott Caan); former protege of McGarrett's father, Chin Ho Kelly (Da.. The Hawaii Five-0 team is back in action in a season packed with more thrills, chases and unexpected turns than ever before. The Third Season begins with the shocking return of Detective Steve McGarrett’s (Alex O’Loughlin) mother, who harbours secrets that could endanger everyone she loves. Meanwhile, the team continues to fight crime and corruption on the islands, while struggling to keep their personal lives intact. Kono (Grace Park) .. The heat's on as the Hawaii Five-O team takes on some of the Aloha State's most notorious and baffling criminal cases involving murder, the Mob, espionage, and kidnapping. With McGarrett (Alex O'Loughlin) and Danny (Scott Caan) at the helm, the team interrogates members of a renegade stunt-bikers gang, pursues a rogue Russian spy with access to NSA secrets, and partners with an autistic child in a murder investigation. Chin (Daniel Dae ..
Own Hawaii Five-0 Season 7 DVD from Deff, DVD, Blu-Ray & 4K Video Specialists - Free UK Delivery..
New crimes, new criminals and new corruption confront the elite federalised task force known as Hawaii Five-0 in the action-packed series featuring the rugged enforcement team whose mission is to wipe out the crime that washes up on the islands' sun-drenched beaches. Season Two starts with a stunner - Detective Steve McGarrett (Alex O'Loughlin) finds himself behind bars, accused of murdering the Governor. The action accelerates with new.. The Hawaii Five-0 team faces some of their biggest challenges yet as they fight to keep paradise safe from the most dangerous criminals on the islands. 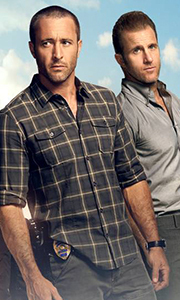 This season, Steve McGarrett (Alex O’Loughlin) and Detective Danny “Danno” Williams (Scott Caan) pursue an expert hacker and are taken hostage by an escaped convict who convinces them of his innocence while the danger of Kono’s (Grace Park) relationship with the son of a Yakuza boss esca..